Over the years, across Fiji, divers have seen an average of 1.22 to 2.03 Sharks on every dive, plus one Ray and one Turtle every 5 to 10 dives. 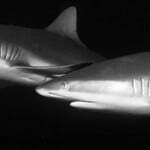 Shark sightings varied year by year, but the general trend appears stable or slightly increasing. 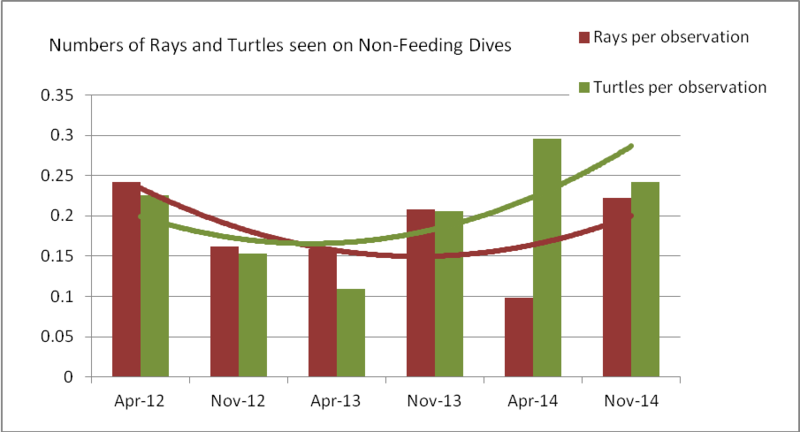 Ray and Turtle sightings appear to be very stable. 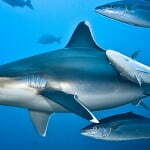 The most common sharks seen on Non-Feeding dives are White-tip Reef and Grey Reef Sharks. Large schools of Scalloped Hammerheads are regularly recorded in a single location, but are only occasionally seen elsewhere. 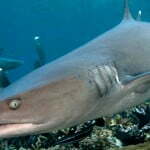 Other species seen uncommonly but reliably in certain locations are Black-tip Reef Sharks, Tawny Nurse Sharks, Leopard Sharks and Guitarfish. 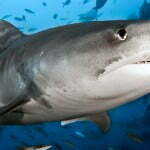 Very occasionally encountered are Silvertip, Bull, Tiger and Lemon Sharks. Great Hammerheads are very rarely confirmed. Grey Reef Sharks (dark grey line) show a pattern of higher numbers every November and lower numbers every April, which may be related to seasonal breeding activities. White-tip Reef Shark (orange line) numbers appear to be slightly declining over the time of the surveys, particularly in 2014. No other obvious patterns can be seen. 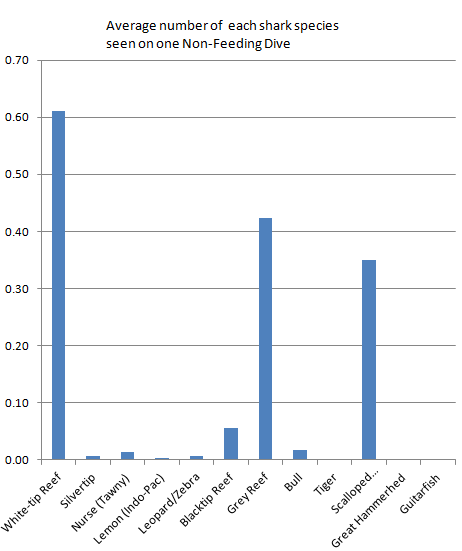 Scalloped Hammerhead (light blue line) sightings are greatly affected by the number of dives done in their schooling location during the survey period. No specific patterns or changes in species population over time were seen.